Fifteen years ago, Kaiser Permanente and Northwest Health Foundation created a fund to support community-led and collaborative efforts to improve health. The Kaiser Permanente Community Fund invested $32 million total in 207 projects led by 146 different organization in Oregon and Southwest Washington. Together, we learned what worked and what didn’t, adjusting the Fund based on our learnings. Now, as the Kaiser Permanente Community Fund is paying out the last of its grants, we want to share those learnings. We know we’re better grantmakers because of this years-long process. And we hope other funders can benefit from it, too. Over the next few months we’ll share stories, infographics, data and analysis that encompass our Kaiser Permanente Community Fund journey and the lessons we’ll carry forward into future initiatives. Sign up for our enews list, and/or follow us on Facebook and Twitter, to follow along with our learnings. Erika Lopez and Felicita Monteblanco: Do you see your values reflected? This blog is the fifth in a series of posts celebrating community leaders who reflect our equity priorities. At Northwest Health Foundation, we know communities need the power and resources to sit at decision-making tables, to help dispel beliefs and practices that do not promote their health, and to help shape those that do. From local school boards to the state legislature, parents and families should have a voice. 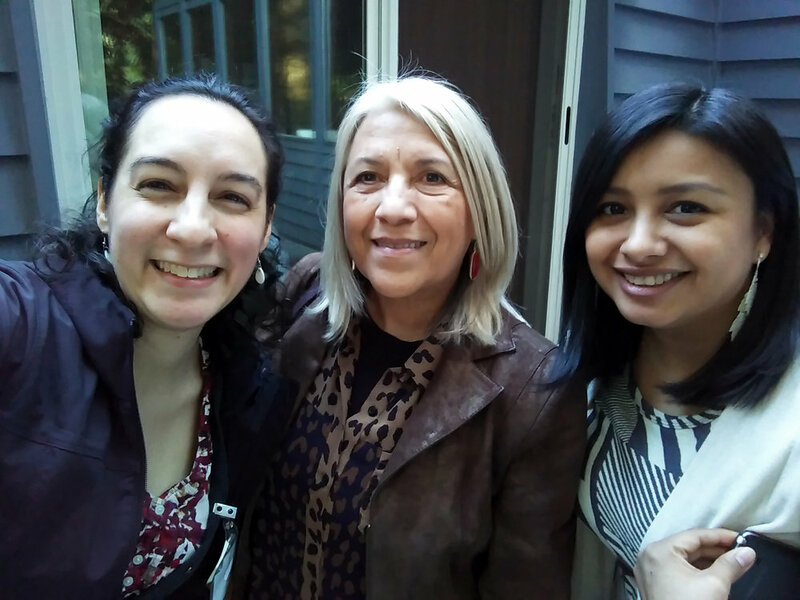 Felicita Monteblanco and Erika Lopez with their mentor Maria Cabellero Rubio, the executive director of Centro Cultural de Washington County. Good friends and proud Latina women devoted to their families and careers, Erika Lopez and Felicita Monteblanco both ran for office in 2017. Neither had campaigned for an elected office before. Felicita had only tried canvassing once – in 2016. They both won their elections. After the 2016 presidential election, when anti-immigrant and racist rhetoric increased across the country, Erika’s ten-year-old son came home one day afraid. He was concerned his mother, an American citizen and immigrant from Mexico, would be deported. Erika was hurt and concerned that this was something he worried about when he should be able to focus on his education. Of course, she could explain to him why she wouldn’t be deported, but he still didn’t quite understand why so much negativity was hurled at his Mexican heritage and community. And while she could comfort him, she worried about all the other students in her community who faced the reality of being separated from their families. She looked at the Hillsboro School District board and saw no representation of the diverse community she lives in. The Hillsboro School District has a majority minority student body, but the board did not reflect that. There were no board members from an immigrant, bicultural, bilingual community. She did not see herself or her community reflected. They didn’t have a voice in the governance of a system that impacts families and students in a monumental way. Felicita also recognized the lack of diversity among local elected officials. In 2013, she joined Vision Action Network. As the coordinator for the Washington County Nonprofit Network, Felicita met many leaders and became more aware of the issues facing her community. In particular, she noticed the Tualatin Hills Parks and Recreation Department’s board was made up entirely of men, most over 40 years old. She didn’t see herself or her values reflected by them. She wondered what it would mean to have the lens of a 32-year-old mixed woman in that space. Felicita and Erika at Erika's swearing-in and first meeting as a Hillsboro School District board member. Erika and Felicita both participated in Emerge Oregon’s Class of 2017. While they were encouraged, and ultimately decided, to run independently of one another, they were thrilled when they found out the other had plans to run for office. Too busy with their own events and door-knocking to campaign for each other, they supported one another in a different, equally important way: empathizing through texts and phone calls. Felicita says their friendship was “life-saving for my mental and emotional health.” Erika described her campaign as “a whirlwind.” She doesn’t think she would’ve been able to get through it without her network of friends, family and coworkers. It’s only been seven months since Erika and Felicita started serving in their respective elected offices. They’re still learning the ropes, getting to know their fellow board members and figuring out policies and logistics. Felicita said: You have 100 ideas when you campaign, but once you’re elected you have to celebrate the small wins. Change takes time. She’s most curious about expanding ideas around what Parks and Recreation can do and exploring how parks can be used to build community and connect people in the unincorporated neighborhoods surrounding Beaverton. Felicita and Erika still support each other. They attend events together. They share their networks, as well as lessons learned in their respective roles. Recently, Felicita went to one of the Hillsboro School District board meetings. Parents from Hillsboro’s Latino Parent Advisory Committee presented at the meeting. Felicita described a moment when Erika, who is bilingual, asked them a question in Spanish. Seeing someone on the board who looks like them, who speaks their native language, was so impactful. Now they know there’s a leader on the school board who understands their needs and can communicate with them in their native language. Hopefully this will empower them to become elected leaders themselves and encourage their children to become elected leaders. More than anything, Erika and Felicita want to use their new positions to lift up more women of color. They want folks to be civically engaged, to see that becoming an elected official is not only attainable, but incredibly important. Their voices are needed. You don’t have to be a certain age or have certain degrees. What’s important is lived experience and representation. If you look at a decision-making table and no one sitting at it shares your values, you should do what you can to sit at that table. Build deep, trusting relationships across race, geography and disability. To Apply: Submit responses to the questions asked in the Request for Qualifications (linked below) to Community Engagement Officer Eduardo Moreno at eduardo@northwesthealth.org by 3pm on Thursday, February 22, 2018.